Alan Tudyk Returns as K-2S0 in Cassian Andor Star Wars Show | Nerd Much? It’s a pretty sweet time to be a Star Wars fan. And if you really enjoyed Rogue One (but let’s be real, who didn’t? ), it’s even more so. Disney confirmed an exciting addition to their previously announced live-action Cassian Andor series yesterday. 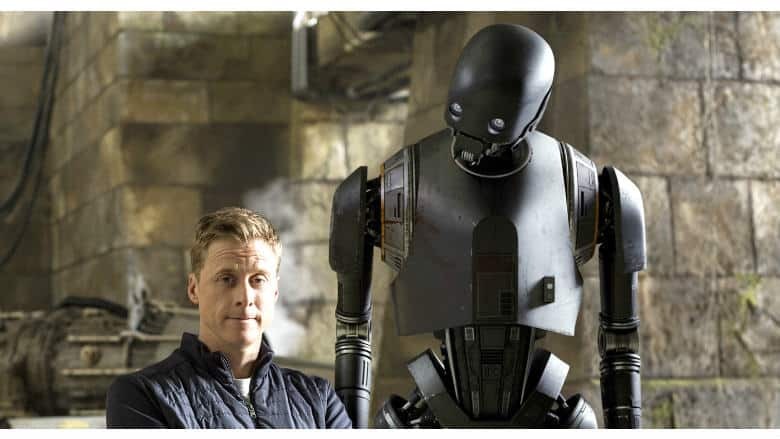 The studio confirmed that the show will now officially include Rogue One’s fan favorite character in Alan Tudyk’s K-2SO. The K-2SO character is a KX-series security droid originally manufactured by the Empire, though stolen and reprogrammed by the Rebel Alliance. He’s a co-pilot and sidekick to Diego Luna’s Cassian Andor. And with Andor’s series being a prequel to Rogue One, fans were hoping and speculating that K-2SO would be along for the ride as well. Disney has previously described the show as a “rousing spy thriller” said to focus on espionage and death defying missions with hopes of restoring order to the galaxy. It’s timetable is set during the time of the Empire’s reign, in the infancy years of the forming Rebellion. The Cassian Andor and K-2SO Disney+ series will be led by showrunner Stephen Schiff, formerly of The Americans. He’ll also executive produce on the show. Even though the Star Wars movies are officially slowing down, there’s still plenty to get excited about. We should be getting some new information on Star Wars: Episode 9 later today. And this weekend will give us our first good look at EA and Respawn Entertainment’s Star Wars Jedi: Fallen Order game. The Cassian Andor and K-2SO Disney+ series will likely begin streaming at some point next year.